And the last set! The money from these will be going toward replacing all the frozen food I lost to the last week with no power. -I can't edit these, they come as is, but depending on the final bids I may do some extra art with the design. Each design comes with two unique files, the main image and the full version of the ghostly spirit form shown behind them here. -Please note which design you want to bid on in your comment, and do a quick scan to see what the current high bid is. The starting Bid for all of these is $7. I will reply with outbid notices as best I can! -Winners will get a high res, transparent background PNG version of their design. These may be used in a non commercial manner, for personal characters and such. You may repost these on your gallery, commission other artists to draw it, etc, just not use it in any manner that you profit from in anyway. I'd offer points if I had any use for them. I just don't have any reason to spend points on DA, sorry! These are really awesome, I just have to say. ooo yay i believe its over~! HB here, I am giving a small extension due to a lot of active bids ATM. Can I bid 30$ on Virgo? The HB on Virgo is currently $40, I'm giving the last few active bids open unless bidding stops in the next few hours. will you please work for pokemon and create the next batch? Please? LOOK, Cancer is cool for once. Ne, skully, do you do customs? Once in awhile, usually when I have free time. Feel free to drop me a note or email! Thanks! I'm looking forward to replacing my giant bags of tortellini and potstickers after this ends. HB is up to $13 via the FA auction. 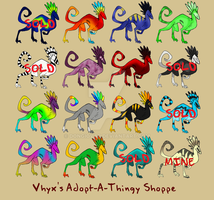 I have to say, these are probably the most beautiful adoptables I've ever seen. HB is now $10 over at FA. And up to $15 on FA now. Thanks for bidding anyway, always glad to see people interested in my designs. And HB to you again. Can do! HB to you. can i match the min bid for now on Cancer? $7?